For many learners, school can feel like a losing battle. We see this in the country’s low matric throughput rates – with only 40% of learners who start school going on to pass matric 12 years later. Merle Mansfield of the Zero School Dropout Initiative asks what can be done now to give our learners a fighting chance. At the start of each year, images of young learners dominate the front pages of our newspapers and take over our social media feeds. We wait with enthusiasm to see small faces with big smiles sporting their school uniforms; families proudly crowded around classrooms to see where their little ones take their first seat. But this is not the full picture of schooling in South Africa – a country where 57% of the population aged 20 and older are without a basic education qualification. In 2015, 15% of learners repeated Grade 1. By Grades 10-12, more than half of learners (52%) in Grades 10-12 will have repeated at least one grade – a figure of significant concern given that grade repetition is one of the strongest predictors of school dropout. These obligatory first-day-of-school photos belie the harsh realities in homes, communities and schools across the country that make getting through each day at school, let alone completing all 12 grades successfully, a daily challenge for many learners. There is consensus among researchers that dropout should not be understood as a single event, but rather the result of a long process of disengagement – a cumulative, multidimensional process caused by the convergence of a number of factors over time. Research suggests that disengagement from school is not a single or instantaneous event but rather the culmination of multiple factors that build up over time – until a learner eventually drops out altogether. Some of these may be pull-out factors, such as gangsterism, substance abuse, physical and sexual violence, household chores, and/or peer pressure that serve to pull a learner out of school. Then there are ‘push-out’ factors – influences internal to a school, such as the quality of school infrastructure, teacher attitudes and practices, as well as school policies and culture that can push a learner away from learning. miss school often, struggle academically or present with psychosocial concerns – all factors that put them at risk of disengagement, and eventual dropout from school. I was reminded of the importance of this work when I met a learner at Mzamowhetu Combined High School in East London some weeks ago. Mxolisi* explained how having a mentor check on him daily made him feel loved and supported like someone believed he could do well in school. Currently in Grade 12, Mxolisi is one of 30 learners in the school who were identified as at risk of dropping out and reintegrated through the work of Masibumbane Development Organisation’s ‘Check and Connect’ programme. Similarly, Khula Development Group in Paarl is working to enhance parental involvement through home visits and parenting groups. 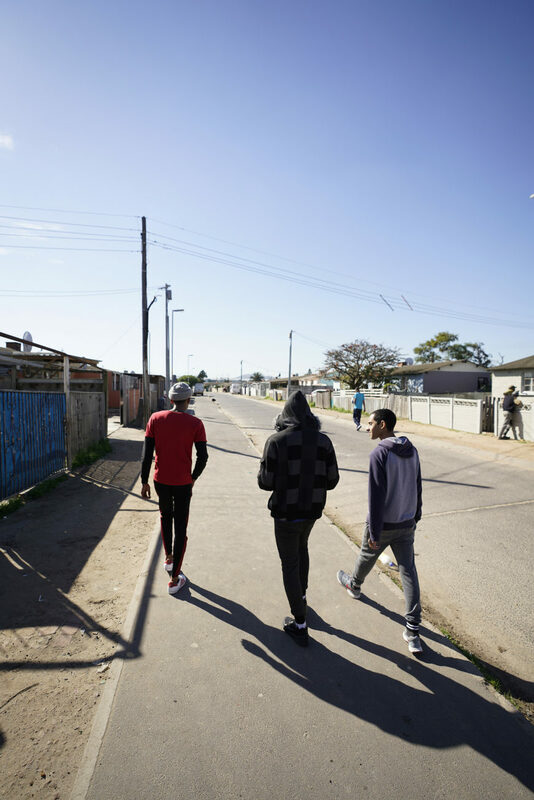 Their ‘dropout catchers’ – who work within this programme and are residents of the surrounding community – physically knock on the doors of homes where learners have been missing school to keep caregivers accountable. BottomUp in Lotus River works with learners directly, getting them to care for each other and make school attendance their top priority. In one of their beneficiary schools, learners took on the late-coming policy that saw a number of learners who travel long distances being locked out of school when they arrived late. Learners worked within their school system to lobby for policy reform that now takes into account learners’ circumstances. As our partners show, there are promising interventions we can use to transform school environments into spaces where learners feel safe and supported; where teachers, caregivers and learners are able to build relationships and connect. Rather than seeing school as a losing battle, we need to help our learners hold onto the promise of that first day of school. We need to ensure that every day becomes about consistent, comprehensive care – and show our learners that there is someone in their corner. Merle Mansfield is the Programme Director of DGMT’s Zero Dropout Schools Initiative. This op-ed was first published in The Cape Times, Pretoria News and The Mercury newspapers on 28 March 2019. Spaull, N. 2015. Schooling in South Africa: How Low-quality Education Becomes a Poverty Trap. South African Child Gauge 2015. Statistics South Africa. 2018. General Household Survey 2017. Taylor, N. and Shindler, J. 2016. Education Sector Landscape Mapping. Jet Education Services. Branson, M., Hofmeyr, C and Lam, D. 2013. Progress through School and the Determinants of School Dropout in South Africa. SALDRU Working Paper 100; De Witte, K., Cabus, S., Thyssen, G., Groot, W. and van den Brink, H.M. 2013. A Critical Review of the Literature on School Dropout. Tier Working Paper Series: Tier WP 14/14. ; Hammond, C., Linton, D., Smink, J. and Drew, S. 2007. Dropout Risk Factors and Exemplary Programmes: A Technical Report. National Dropout Prevention Center at Clemson University and Communities In Schools, Inc.